Banff National Park has some of the best hiking the Canadian Rockies offer, even if all you have is three days. Here is a sampling of what you can do with a long weekend and a backpack in Banff National Park. Lake Minnewanka, one of several short backpacking trips in Banff. A popular early or late season hike or bike along the lakeshore. The trail departs from the trailhead at the Lake Minnewanka day use area and returns by the same route. During the summer, Lake Minnewanka is a popular destination for motorboats. Stay an extra night and explore Aylmer Pass or Aylmer Lookout. Seasonal closures of Lm8 campground and Aylmer Pass area during buffalo berry season. Check trail report for current conditions. 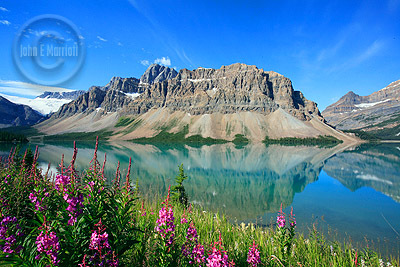 A popular early season hike that departs from a trailhead north of Saskatchewan Crossing on the Icefields Parkway and brings travellers to a campsite at one of the largest backcountry lakes in Banff National Park. Twin Lakes can be reached by two trails. The first departs from the Vista Lake viewpoint on Highway 93 and continues over Arnica summit. The second begins at Altrude Creek just off the Trans Canada Highway and follows a less strenuous, and less scenic, route. Backpacking Banff National Park is an unforgetable experience. Departing from the Mt. Norquay ski area, the first few km of the trail climbs through dense forest. The campsite is located in the open subalpine meadow of Elk Lake Pass, about 2km before Elk Lake. This area is frequented by commercially guided horse trips. This trail begins at the Mosquito Creek trailhead (along the Icefields Parkway). Stay at Mosquito Creek campsite as a base (approximately 6 km from trailhead) and make a side trip over Molar Pass through some of the most extensive alpine meadows in Banff National Park. Fires are not permitted.